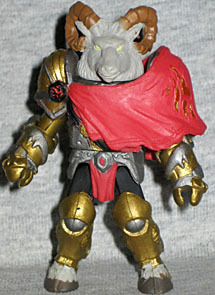 Raised in the ways of the Battle Beasts, the ram Vorin was taught the art of combat from a young age. But after a lifetime of violence, he seeks out a different way and will battle to make his vision of the future a reality. 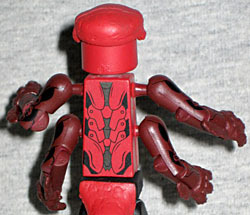 Rather than try to force a standard Minimate cylinder head to stand in for a ram's head, Vorin gets a new noggin. It's sculpted with a large ruff of fur around the neck, a full snout and two large horns that burst out of his forehead and curve down around his ears. It's a really nice representation, considering the size. The biggest surprise with this figure is that the mold isn't the same seen on the promo releases. 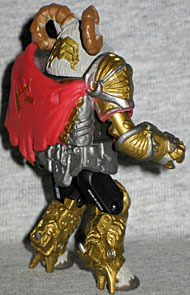 The previous ones had exposed chest armor, while this one has his cape/shawl thing draped further down his torso. That doesn't mean they skimped on the detail, though, because the edges of the armor that poke out are still fully detailed, the cape is wrinkled and has two sculpted symbols on it. He's got a fancy belt with a sheathed knife sculpted on the back and a short red loincloth down the front, a pair of large, complex gauntlets, and new lower legs that give him both complex greaves and fur-trimmed hooves. His arms are gold and his chest silver - and if you take off the armor, the chest is painted with anatomical details, which is just a little bit weird. 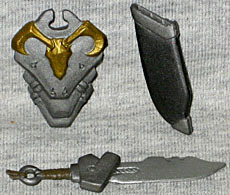 Vorin's accessories include a layered grey shield with a stylized ram motif in gold in the center. A handle on the back allows the figure to hold it, but there's also a superfluous nub back there that we can't figure out. He has fancy sword with a large silver blade, a grey hilt and a strip of brown (leather?) tied around the ring at the end. When he's not holding the sword, it can fit in the big sheath that plugs into his back. 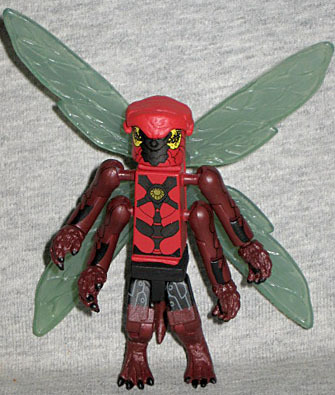 A dragonfly, Zik is one of the fastest beasts in the air, and one of the most vicious. His favorite strategy is to hover over a fray, analyze the combatants with his multi-faceted eyes, then strike at the one whose back is turned. Man, I'm really glad they just came right out and said what animal Zik is supposed to be, because we never would have been able to guess it by ourselves. An insect of some sort, yes, by a dragonfly specifically? Nope. DST said that the reason they went for Zik instead of a character who's actually appeared in the comic already is that he was the only one that was far enough into production to get out the door in time for SDCC - so maybe some corners had to be cut to even get him ready. For instance, the head. What's the defining feature of a dragonfly's head? The huge eyes. What doesn't Zik have? Huge eyes. He gets the standard Minimate head and with new, lumpy cap to keep it from being plain, but his eyes are just painted on. To really sell the look, they should have been add-ons. You know, like Buzz-Off's hat. Other than the bumpy head, all of Zik's parts came right out of the existing catalog. The wings? Wasp. The long, four-armed torso? Theatre Ghost. Hands? Gill-man. Legs and tail? Lizard. It's clever re-use, but it's re-use nonetheless. His colors are red and brown, with black detailing. The paint on his chest looks like detailed armor. He has more apps on his back, but you'll never see them unless you remove the harness that his wings attach to, and that's kind of a shame. And while we're on the subject, one of the wing-pegs must be mis-sized, because no matter which wing is on there, it just flops around and wants to fall off. The super glue trick should take care of that, though. This is our first painted Vorin, so this set would be worth it just for that. 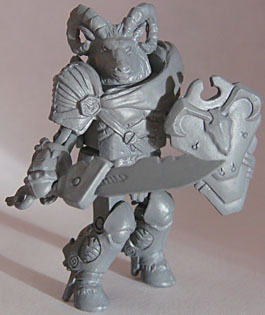 But Zik, as the third new Battle Beasts character, is just the icing on the cake. No, he doesn't have as many specialized pieces as Vorin does, but it's neat to see what can be accomplished just by recycling. The packaging is stylish, with Dan Brereton art (from the cover of the comic's first issue cut out and rearranged) across the top and the "flame" logo behind the figures. It's definitely eye-catching. 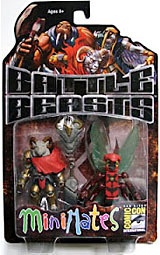 With this SDCC exclusive two-pack, the Battle Beasts are off to a good start, so hopefully we'll get to see more of them at actual retail locations, not just online shops.